ASOC funds a variety of services on campus that enhance the Oxy student experience by providing resources as well as employment and leadership opportunities. The following services provide everything from entertainment (annual SpringFest Concert, discounted movie tickets) to transportation options (Bengal Bus, Bike Share), sustainability projects (FEAST organic garden, sustainability fund) and student media (radio, TV, newspaper). Take a look at what’s available! This student-run program provides free and low-cost transportation to the surrounding neighborhood, L.A. airports and other locations around town like Target, Trader Joe’s, museums, beaches and more. Bike Share is a student service that rents bikes and offers reasonably priced maintenance and repairs for student bikes. It also promotes cycling in Los Angeles and related events like CicLAvia. 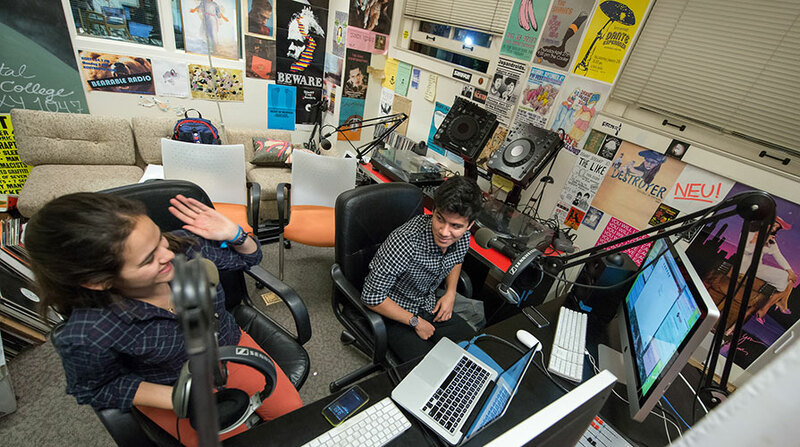 The station broadcasts a weekly variety of eclectic and relevant entertainment, news and opinion to Oxy students, staff and alumni. It provides rising filmmakers, designers, performers and artists with a highly visible platform to showcase their talents. Located below the UEPI house, FEAST is a student run organic garden that is open to all students. It also raises a brood of hens, offers workshops, and hosts potlucks and harvest fairs. A hub of student life. Your morning ritual. A showcase for student talent. A home for the chaos that is caffeine. The Green Bean Coffee Lounge offers the entire campus community a simple yet satisfying coffee lounge experience. You can even order online! KOXY serves the Occidental campus and the community of Northeast L.A. as an outlet for diverse music, concerts and cultural events. Reflecting the diversity of the student body and the surrounding community, we're always interested in new DJs and events. Email us at koxy@oxy.edu. La Encina is Occidental College’s official yearbook, produced by a student team of photographers, editors, writers and yearbook aficionados. As the official student newspaper of the College, The Occidental endeavors to provide fair, accurate and balanced journalism of the highest quality to members of the campus and local communities, maintaining the highest professional journalistic standards and ethics. If you are hosting an event, planning a fundraiser, presenting a speaker or showing a movie, let Design Service help you spread the word. It offers free design work for student organizations and takes on administrative job requests for a small fee. Through ASOC funding, the student programming board plans and markets major campus events like Spring Fest, collaborates with other student services on events, and creates a sense of community and school spirit at Oxy. The ASOC sustainability fund was established by students to help fund projects that make Oxy a more environmentally sustainable community. It empowers students to carry out their own visions for sustainability. SAC loans out chalk, tape, paint and quad-sitting equipment to clubs and other on-campus organizations to help them promote their events and messages. It also offers discounted movie and theme park tickets and rents out camping equipment.